Let’s start off with a couple of questions: How stressed have you been lately? Do certain things or people in your life make you feel overwhelmed? Are you trying to make changes and nothing seems to be working or getting you there? Sometimes, life get busy and stressful. It happens. It throws you off your routine and getting back to it isn’t always easy. In the last couple of months, I got so busy and wrapped up in projects that I lost the great routine I had set for myself earlier this year. I’m back on track now, thanks to a series of small changes I added to my routine to help me get there. No change is too small to make a difference. Sometimes all it takes is a few little things to make an improvement in your overall happiness. The effects may not be immediate, but be patient; they’ll come. 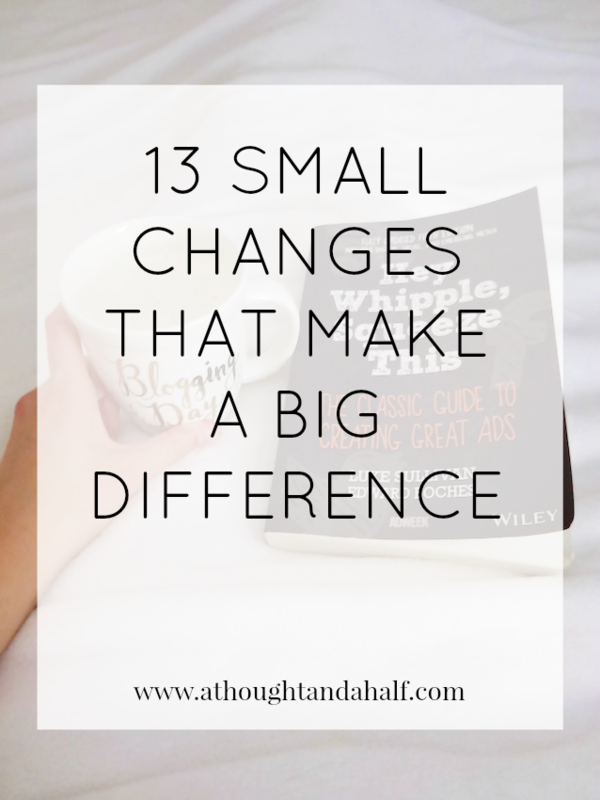 Here are 13 small changes that can make a big difference in your life. Set your alarm for 10-15 minutes earlier than you actually need to wake up. If you’re one of those people who needs a few minutes to get going, setting your alarm back helps so you don’t lose time instead. 10 minutes isn’t so bad. Drink a glass of water first thing in the morning. Like, even before your coffee or tea or whatever your morning drink of choice is. Drinking an 8-ounce glass of water first thing in the morning wakes up your entire body and starts your digestive system on something other than a cup of coffee. Eat a good breakfast. Like, more than a granola bar and some yogurt. Breakfast is the most important meal of the day and skipping it usually results in eating more later in the day. 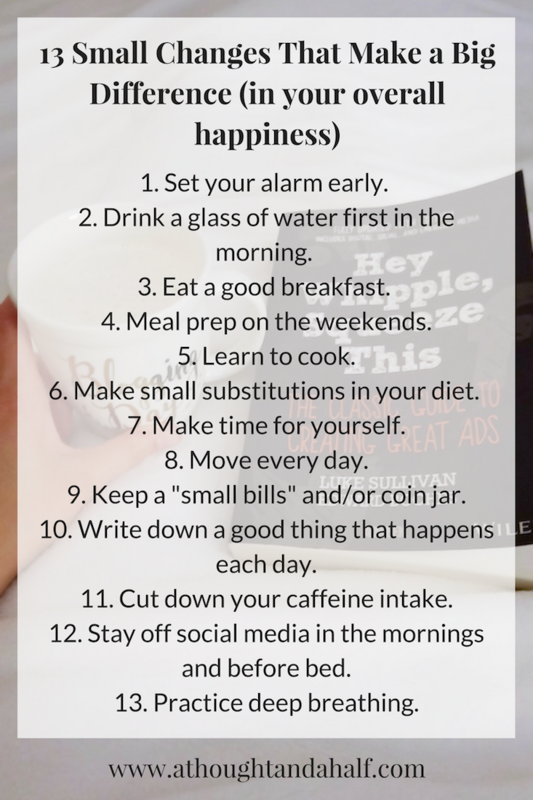 Plus, eating breakfast is a great way to jumpstart your mind before your day gets going. Meal prep on the weekends. It can be a little time consuming, but it’s really worth it. I spend several hours every weekend (usually on Sundays) cooking one or two meals to package up for the rest of the week. Those usually end up as lunch at work, but they make great dinners after work and my evening gym sessions. Those four hours on Sundays are so worth saving time during the week. Learn to cook. Doesn’t have to be anything fancy. Just pick two or three solid, healthful meals so you don’t have to spend a bunch of money on meals during the week. I cook every week and it’s actually pretty relaxing! Make small substitutions in your diet. Switch out sour cream and use Greek yogurt instead. Drink fruit-infused water instead of juice or soda. Use lean proteins instead of red meat. Make your own sauces and dressings. I’m not saying making small changes like these will make you lose a bunch of weight fast, but I definitely could tell a difference after a couple weeks. There are a ton of other diet substitutions you can make, too. Make time for yourself. Even if it’s just 15 minutes or half an hour. Go to the gym by yourself, or read before bed, or fix a cup of tea at night. Or do some morning yoga. Taking time for yourself is super important in the mental-health and self-care game. It gives you a chance to focus on your goals and intentions and reflect on how you can make them happen. Move. Every day. Whether it’s taking the stairs instead of the elevator, having walking meetings instead of sitting meetings or a workout session at the gym, your body needs movement. You know what Elle Woods says: “Exercise releases endorphins. Endorphins make you happy.” And it’s just good for your muscles, joints and body. Write down one good thing that happened each day. Whether it’s in a journal or on a scrap of paper that goes in a jar, remembering the positive moments in your life, no matter how small, is a key to happiness. I keep a “good vibes” jar on my bookshelf, where I keep happy moments and memories written on pieces of paper. It’ll be so fun to go back and read those at the end of the year. Cut off your caffeine intake after a certain time of day. For me, that time is around lunchtime. If I need a boost in the afternoon, I opt for a cup of tea. Every now and then I’ll treat myself to an iced coffee or mocha in the afternoon, but only on days when my stress level isn’t too high. Espresso and anxiety is not a good combination! Keep a “small bills” or coin jar on your dresser or nightstand. This is a super easy way to save some money, even if it’s only a small amount at a time. In fact, I keep a coin jar AND a small bills jar on my dresser and try to contribute to each once a week. Don’t look at social media within an hour of waking up or going to bed. Sure, social media is a great place to get news and updates, but there’s also a lot of content that has a less than positive effect. I’ve been making a more conscious effort to hold off on checking my social media until later in the morning, and it’s improved my overall mood lately. Related: if your social media feeds annoy or upset you more often than not, it may be time to unfollow some people. Or take a break in general. Practice deep breathing, especially when you feel overwhelmed. Taking a step back from a stressful situation helps clear your mind so you can address it more calmly (and ideally more rationally). Breathe in for 3-5 counts, hold it in for 3 counts, and then exhale slowly. This is also a great cadence for falling asleep at night. Even when life gets busy and overwhelming, there are ways to ease stress and make life easier. Small changes really can make the biggest differences in stress management and overall happiness. What small changes are you making in your life? How are they helping your stress management?